TYPE: Baptisia australis and Baptisia tinctoria - perennial. PLANTING: Start seeds indoors in the winter and transplant them to outdoors in the spring. BLOOM/FRUIT: Spikes of blue or yellow flowers followed by 2 to 3 inch seed pods. Clover-like blue green leaves. 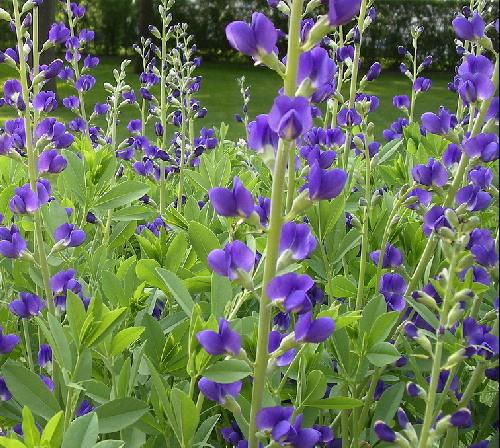 Wild indigo comes up easily from seed but doesn’t bloom until the third year. Seed looks like Eve’s necklace. Flowers are good for cutting. GROWTH HABITS/CULTURE: It has a long taproot which makes transplanting difficult. Easy to grow and maintain. Does well in most any soil. Likes full sun but will tolerate light shade. Baptisia does not encroach on other plants. HARVEST/STORAGE: Harvest the woody stem and leaves before blooming. Harvest roots in fall. MEDICINAL USES: Antiseptic, used topically to treat cuts and wounds. Historically used to treat typhoid fever. LANDSCAPE USES: Great as specimen plants or massed. Blue green foliage. OTHER USES: Dye plant - use fermented woody stems and leaves of plant to produce a rich blue dye.